Is Bollywood maturing? Is it growing the way it should to be recognized as international cinema? Is it being discussed outside India by not non-resident Indians, but foreign audiences? Is it breaking new ground in cinema or even entertainment? 2007 was however not a year to answer all these and many other questions of one of the world's biggest cinema factories. Yashraj Films may be a big banner but look at how Yash Chopra's Jhoom Barabhar Jhoom did. It deserved to bomb and it did. Despite Amitabh Bachchan and Abhishek Bachchan and Preeti Jinta. Hello, there needs to be a story for a film to rest on. Then there was another Yashraj film, Laaga Chunari Mein Daag. Even roping in one time award-winning director, Pradeep Sarkar, did not help. Audiences flocked to see the film in the initial weeks thinking he would have produced a film better than his first film, Parineeta, but left the theatre disappointed to see a typical masala potboiler. Hours later they had even forgotten the story. Again having good names is not enough: It had Jaya Bachchan, Rani Mukherjee, Anupam Kher and others. All wasted. Aaja Nachle, was hyped so much being Madhuri Dixit's comeback movie, but it did not work despite the marketing. It is however much more watchable than Jhoom Barabhar Jhoom and Laaga Chunari Mein Daag as it atleast has a story that is slightly off-track. But it had all the ingredients of Hindi films watering it down. Leela Bhansali who is now taken seriously after Black, did manage to get an audience in the first few days for Saawariya but it lost steam soon after. It deserved to. Again, there is a lesson to learn here. You cannot make a movie to launch your friend's sons or daughters. It was a launch pad for Ranbir Kapoor and Sonam Kapoor. God knows where they will go now. They should have read the script before they signed. Anurag Kashyap who has written scripts like Satya, decided to turn director afterBlack Friday, a docu-film on the Mumbai blasts. He is a young man full of promise, but his film, No Smoking, turned out to the worst disaster of 2007. It ran to almost empty houses for a week. His plot was too complicated for the Hindi audiences wanting entertainment. But his deep meanings entwined into a very complicated script, were lost on the audience. Even the critics did not understand it. Why does Bollywood with so much of talent want to dole out remakes? One of the worst films came from the master who has obviously lost his touch. Ram Gopal Verma who broke new ground with films like Satya, Company, Kaun and others and got some new young directors produce good cinema, thought his name would work. So he appropriately called his film, Ram Gopal Verma ki Aag. But the remake of Sholay had no fire, no life. It was clearly his worst film. He was dismissed as a megalomaniac who had just got too arrogant. Critics wrote him off after this venture. If only he thought of cinema, he can still bounce back. In today's Bollywood, no one can call himself or herself a brand. Not even Amitabh Bachchan who did a cameo in Jhoom Barabar Jhoom. But he continues to be the actor in Bollywood. Last year, his best film was Black. This year, with his unusual role in Cheeni Kum, he continued to break new ground and surprise audiences. The lucky one was of course Sharukh Khan, the King of Bollywood. With Om Shanti Om, which was one of the biggest grosser of the year, he stayed on top. But what the critics loved was not this film, which apart from its slick production and songs, had little. It did well as Farah Khan had her finger on the pulse of the typical Bollywood filmgoer's idea of entertainment. 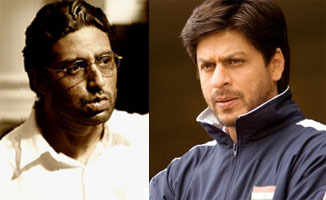 Everyone will remember Sharukh Khan in Chak de India, which was a super hit. It did not even have a heroine, but the script sizzled. Sharukh tugged at patriotic heartstrings as a women's hockey team taught us all about teamwork and determination. It was a simple story that stayed with you for months after viewing. Two super hits and he is laughing all the way to the bank with his producers. Shows how walking on a track not walked on before, helps. Mani Ratnam also produced a hit last year with Guru. Profiling the life and times of wealth creator, Dhirubhai Ambani, he got excellent performances from Abhishek Bachchan and Aishwarya Rai. It was also made into a Tamil version, which did well. Sometimes, simple stories like Jab we Met click. Imitaz Ali brought life into this film helping the sagging careers of Shahid Kapur and Kareena in a simple romantic tale. Even Aamir Khan's first directorial venture, Taare Zameen Par, did not make the impact one thought it would though it is still running into 2008 as it has just been released. Bollywood is crying out for experiments. But there are hardly any takers. Some like Rajat Kapur churn out films like Bheja Fry which did not even cost a crore or rupees to make. It did well and that is the exciting thing. India's Bollywood that churns out over a 1000 films every year to be watched by over four billion in theatres, it is sad commentary that so few make the grade. A Sanjay Leela Bhansali multi-crore film may bomb due to a stupid story, but there is space for innovative ideas and presentation. Any takers in 2008?